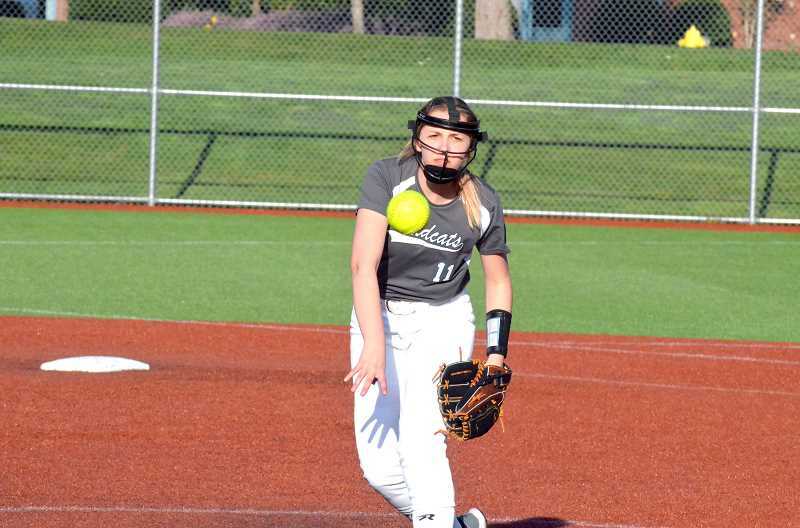 Wilsonville's softball team has had a tough go of things this preseason run. After going 2-5 leading up to the final preseason game against South Albany, the Wildcats were looking to enter the Northwest Oregon Conference (NWOC) on the strength of a win. Against the Red Hawks they nearly got the job done with a strong push late, but came up just short 14-12 on Friday, April 5. South Albany jumped out to an early lead 8-2 by the end of the third inning, and continued to extend its lead by the sixth inning. Wilsonville trailed 10-4 by the start of the sixth inning, and after the Red Hawks put another two runs on the board, things looked dire for the home team. In the final innings, the bats came alive for the Wildcats. Wilsonville put up five runs in the sixth, and another three runs in the bottom of the seventh, but that was as close to victory as they would come. South Albany walked away with the win 14-12 on the day. Junior catcher Maryssa Miller had three hits and four quality at-bats (QABs) in her appearances at the plate. Sophomore Riley Rupp had 27 first pitch strikes and four strikeouts on the mound. The league season starts off with Wilsonville welcoming NWOC debutante Scappoose (2-5-1) on Tuesday, April 9.